Our Daily Manna For Champions 26 November 2018 – RELEASE THE CHAIN NOW: FORGIVE! TOPIC: RELEASE THE CHAIN NOW: FORGIVE! I like what Mother Theresa said, “People are often unreasonable and self centered. Forgive them anyway. If you are kind, people may accuse you of ulterior motives. Be kind anyway. If you are honest, people may cheat you. Be honest anyway. If you find happiness, people may be jealous. Be happy anyway. The good you do today may be forgotten tomorrow. Do good anyway. Give the world the best you have and it may never be enough; give your best anyway. For you see, in the end, IT IS BETWEEN YOU AND GOD. IT WAS NEVER BETWEEN YOU AND THEM.” Wonderful! Look at what Joseph told his brothers, “Fear not; for AM I IN THE PLACE OF GOD?” God is the only one who reserves the right to CONDEMN people who have hurt and offended you. When people hurt you, it’s like they are throwing a big chain on you path to tie you down. Refusing to forgive them is like taking the other end of the chain and tying yourself to them. So, you cannot go wherever you want to go again. You become tied down. But when you forgive, you immediately cut off that evil chain so you can be free to live your life and move on to the greater things that God has for your future! When you forgive others their offenses, you give God the opportunity to FIGHT FOR YOU. And when He fights for you, the victory He will wins for you will be far sweeter and refreshing than VENGEANCE! 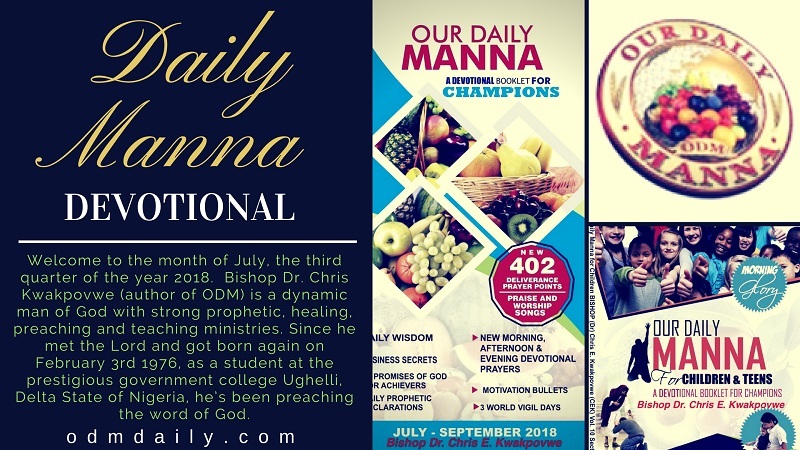 Give out the 2019 Our Daily Manna as Christmas and New Year gift items. Get your copies from your nearest bookshop now! I prophesy a special testimony as you do so! Be expectant! PRAYER POINTS: Take your best worship as led now. READ Our Daily Manna Devotional For Today 16 April 2018: THE FAKE HAWAII ALARM! THERE IS ONLY ONE LION! 3. As 2018 ends, AGAIN, I let go of the hurt of the past concerning the following persons (mention names). 4. Lord, RESTORE whatever I have lost this year due to bitterness, unforgiveness and anger in Jesus name. Next Post:Our Daily Manna November 2018 Day 27 – REVISITED! SECRETS UNCOVERED!